Ajax manager Erik ten Hag confirmed Frenkie de Jong has suffered a hamstring problem, but didn’t rule him out of their upcoming trip to Juventus. 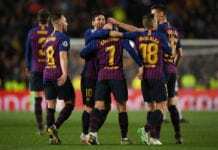 The Barcelona-bound playmaker was forced to abandon the pitch in the 28th-minute during Ajax’s 6-2 demolition of Excelsior in the Eredivisie. De Jong was seen heading into the John Cruyff ArenA tunnels moving cautiously and holding the back of his leg. Naturally, this sight left Ajax supporters feeling alarmed ahead of the club’s trip to Turin on Tuesday for the second leg of their Champions League quarter-final tie against Juventus. The two clubs are currently tied at 1-1 on aggregate following a first-leg draw in Amsterdam last week, which saw David Neres cancel out Cristiano Ronaldo’s opener. However, Ten Hag insists his decision to withdraw De Jong on Saturday was more of a precaution. Although he couldn’t provide any further details on his fellow Dutchman’s injury. “There is not a whole lot I can say about Frenkie right now,” Ten Hag told Fox Sports NL. He added: “There weren’t any issues before the game. “Frenkie was fit to play, but on the pitch, I saw him struggling with his movement. As for the match itself on Saturday, former Real Madrid striker Klaas-Jan Huntelaar scored a hat-trick for Ajax. Dusan Tadic got a brace and Kasper Dolberg scored the other goal as Ten Hag’s side went three points clear at the top of the Eredivisie table. Although title rivals PSV Eindhoven can move back level on points with Ajax this afternoon if they defeat De Graafschap.